מאת יובל ~ 22 במאי, 2010. בקטגוריית: English, ארגנטינה, יין, יקבים, מדריכים. 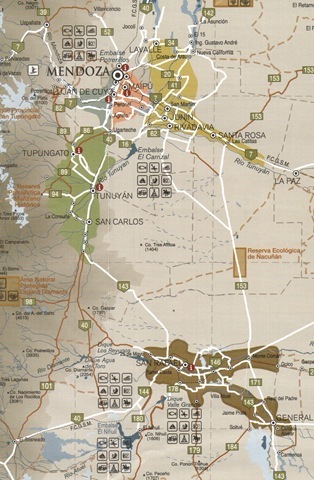 I arrived in Maipú especially early because I decided to ride down to Luján De Cuyo in the Luján De Cuyo Region. I hooked a right on Perito Moreno Road and crossed Argentina's famous Route 40. Moreno Road turned into Aráoz Road until I was finally able to turn left onto San Martín Avenue. Riding on San Martín I was again shaded by a massive canopy that stretched along the entire road. After peddling for about 20 km I arrived in Luján De Cuyo. I pulled out my wine map and was reminded that I notified Bodega Alta Vista that I plan to come for a tour at 13 o'clock. I started peddling south and stopped at Bodega Lagarde where the guard talked to a woman who said to come back at 14. 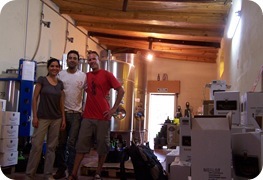 I arrived at Bodega Luigi Bosca at 11:30 only to be told to come back at 15 for the next tour. Now that I had some reservations and had some time to kill, I sat down and opened the map again. I spotted Bodega Carmelo Patti along San Martín Avenue. I only recognized the building by its number – 2614. I dismounted my bike in a small courtyard and walked toward an office door. Seeing somebody talking on the phone I knocked gently and waited. When the call was over I walked in and introduced myself. The person who I shook hands with was none other than Senior Carmelo Patti himself. I described my enthusiasm for a small tour and some wine tastings. Senior Patti (he told me to call him Carmelo) was happy to accept and I would soon learn that only he conducts the tours of his winery. After 10 minutes of trying to understand his Spanish I finally understood to follow him into the office for some tastings. All 3 wines I tasted were absolutely fabulous. I started with a Malbec 2004, with aromas of strawberry and cherry, and the same flavors with a nice soft round fruity finish. Next I indulged in a Cabernet Sauvignon 2002. With its' port color and spicy clean laundry aroma, it was a bit tough and hard on the tongue with a sour aftertaste. 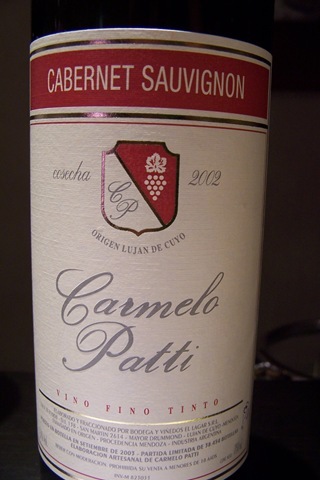 Carmelo's Gran Assemblage 2002, a blend of Cab, Malbec and Merlot is one of the best wines I have tasted my whole trip. It has an overpowering ruby red color, with fruity aromas, a full-body wine with plum-berry flavors and smooth fruity long-lasting finish. Sr. Patti is a true winemaker whom I loved to listen to and learn from as well. I said my "Muchas muchas gracias" and rode on to my next destination. 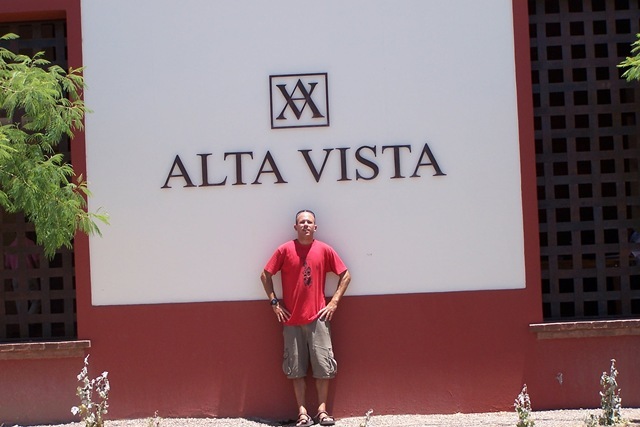 I rode for about 7 km and arrived at Bodega Alta Vista at 13 o'clock. Unfortunately it was their "siesta" so I was told to return at 16 o'clock. I rode back to Bodega Lagarde only to find out that it was the woman's "siesta" as well. I rolled my eyes and went to sit down in the shade. I pulled out my map and tried to find more wineries to visit. I decided to keep on going south on San Martín and explore the area. It didn't take long until I came upon another winery. I rang the bell on Bodega Ruggeri's gate. Nobody answered but after a few minutes somebody showed up at the gate and told me to come back around 17 o'clock. After buying and eating big juicy bagget bread from a gas station thrift store, I started my way back to Bodega Luigi Bosca. After another 4 km ride I entered the big white gate of Bodega Luigi Bosca for the second time today. I shook the guard's hand and asked him how he is doing. I went to the office where a tall tailored woman greeted me with a big smile. 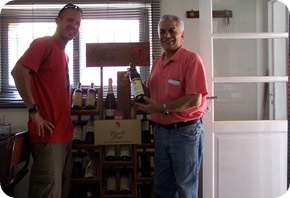 After waiting for 5 minutes, the tour guide escorted me to the tasting room where I was ab out to taste 4 wines. 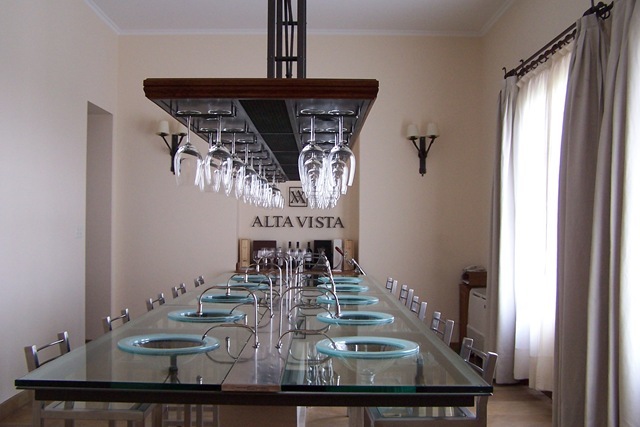 Entering a big stylish room, I noticed that there are windows in the floor that through them I could see the winery's wine cellar. I sat up to a nice big curved wooden bar where wine glasses were already waiting. I tasted a Chardonnay 2006, a Malbec 2006, a Merlot 2004, and a Syrah 2006. All 4 wines were average or below and mostly flat. 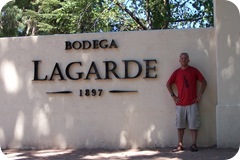 I thanked my guide and peddled another 6 km to Bodega Alta Vista. 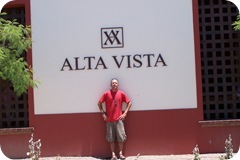 I arrived at Bodega Alta Vista just as a tour ended. 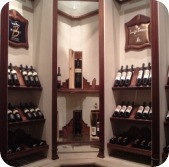 I entered through the back door where on my way to the main display room I noticed a spectacular designed professional tasting room. I photographed the room through the glass and kept going. They had a nice simple display of their wines with glass cases and focused spotlights. I tasted 3 wines, a Chardonnay, a Malbec and a reserve Syrah. Out of the 3 I enjoyed the Malbec the most. Its dark color with dry plum and sour cherry aromas made it very distinguishable.This Malbec has a good cherry-berry flavor with a fine fruity finish. Even though I still had some rounds to make, I decided to buy a bottle of wine. I bought a Premium Torrontés 2007 and another bottle opener (my 3rd). The tastings themselves cost 20 pesos. I said goodbye and walked outside to a still sunny late afternoon. It was already 16:45 so I started peddling fast towards Bodega Ruggeri. 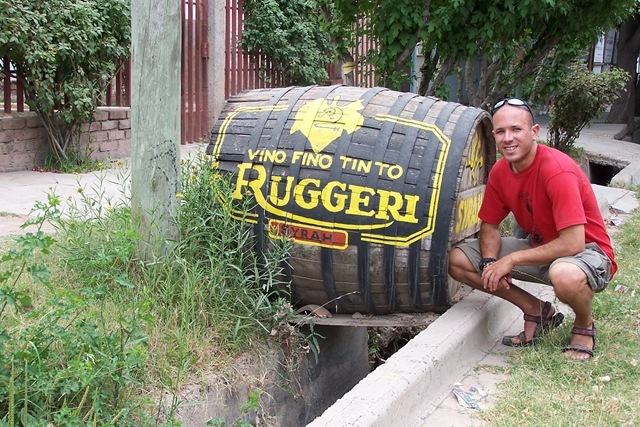 I entered Bodega Ruggeri and walked over to the office. The girl sitting at the desk sent me into a small warehouse. I walked up a few steps and encountered a couple of workers engrossed in their work. I walked in and said hello. I talked to the woman (I can't remember her name) and said that I was interested in having some wine tastings. She said "Claro, no problema." and I followed her into the room where 5 big stainless steel tanks stood. As she opened the valve and poured me a Merlot 2006, she told me that this is the first time a tourist arrived on a bike and arrived at the winery. Uncharted territory, I love it. She told me that all the tourists are attracted to the bigger and more high-tech wineries. In return I told her that her winery is the kind of winery I love, a small family winery without the big machinery rooms, stainless steel tank tastings, and of course good people. 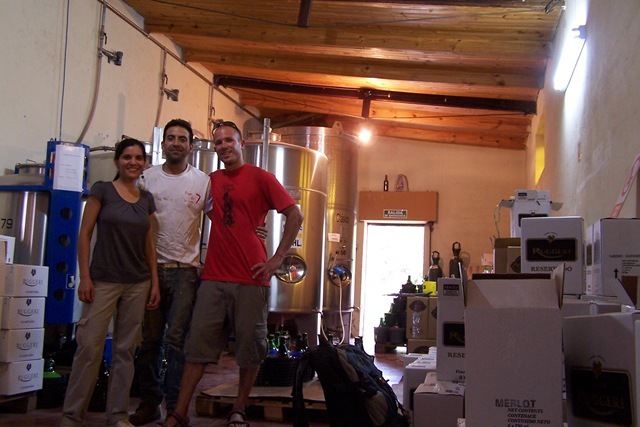 As I tasted the bodega's wine, the woman kept on working. E very glass I finished, the woman took my glass and opened another tank valve where fabulously colored wine always poured out. 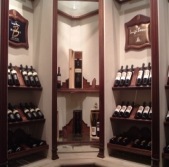 I tasted all five 2006 wines, a Merlot, Syrah, Cabernet Sauvignon, Malbec, and last a white Pedro Gimenez. 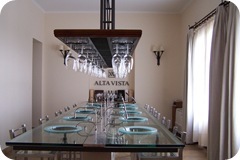 Most of the wines had fruity aromas, fruity flavors with sour aftertastes. I liked the Syrah the most because of its heightened spicy aroma. 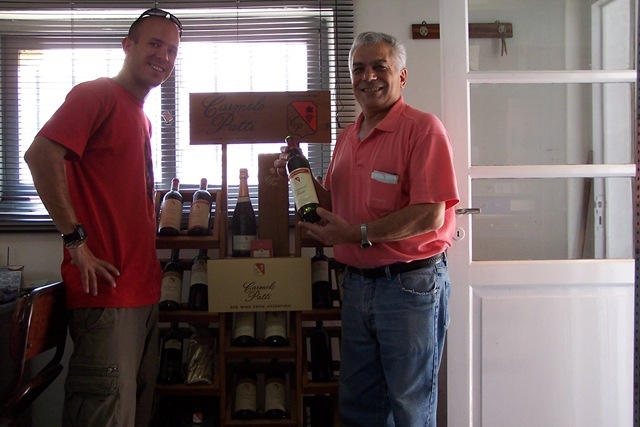 The Pedro Gimenez had green olive grape aromas and pineapple flavors, a really fresh invigorating wine. I had such a good time just talking to the woman and drinking wine, as simple as that. In the end I took a group photo and said goodbye. After the 25 km bike ride back, I arrived at the bike shop at 19 o'clock in the evening. This time Hugo wasn't there for some reason so I waited for the bus alone. Ten minutes later I got on the bus and fell fast asleep, waking up just as we arrived in Mendoza. שלום לכולם. המפה שלמעלה שימשה אותי במנדוזה, לבסוף יצא לי לסרוק כמה מפות למחשב ומעכשיו אני מקווה שמיקומיי חלק מהיקבים שבהם בקרתי יהיו יותר ברורים.